Gosh, the New Ruby, I've almost forgotten about you. Situated in one of the endless strip malls along Scott Road right next to a laundromat, your 70's red decor has probably not changed since it first went in. Oh and how can I forget the cheap combos (for only $5.95!) 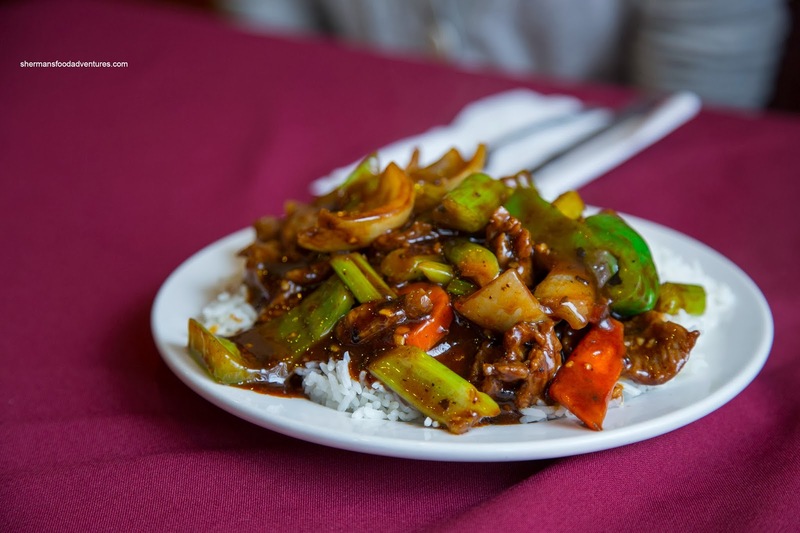 that include such classics as radioactive red sweet n' sour pork and authentic chop suey (an oxymoron of sorts). Sure, the food ain't gourmet, but it fills the tummy. With those memories, I dragged Miss Y, Hot Mama and Zamboni Guy out for some North American Chinese fare. 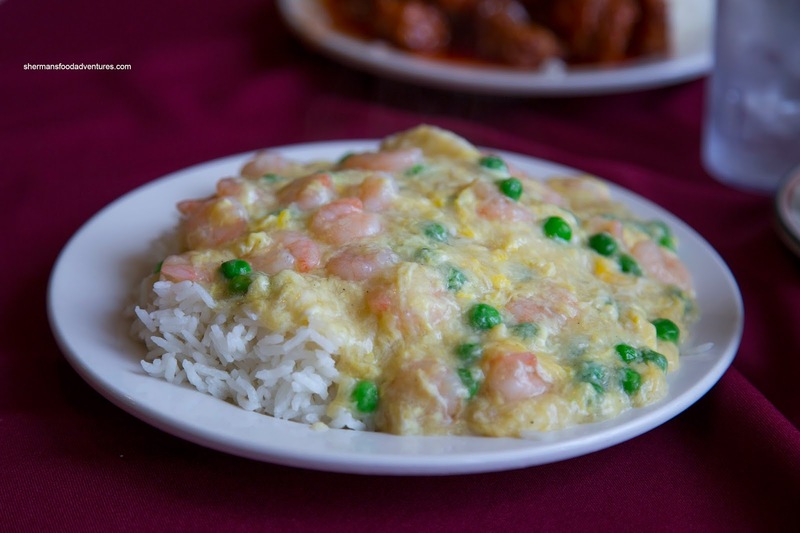 For myself, I went for something that was somewhat "more Chinese" being the Scrambled Eggs & Shrimp on Rice. By the looks and taste of it, there was more starch-thickened sauce that scrambled eggs. However, it did taste okay with buttery little shrimp nestled in a mild-tasting thick sauce. I wasn't a huge fan of the peas as they were quite hard. Miss Y ended up with the Black Bean Beef on Rice and it was pretty flavourful. The black bean sauce was dark and not overly diluted. Hence, there was a rich saltiness that went well with the peppers and onion. As for the slices of beef, they were tender with a slight chew. Zamboni Guy ended up choosing 2 items for $5.95 and went for the Broccoli Beef as well as the Sweet n' Sour Pork (Hot Mama had the S&S Pork with rice). A great value for the price as the plate was pretty darn full. The re-fried pork was a touch on the drier side, but had a nice crunchy exterior (even with the sauce). The sauce was not overly radioactive in colour this time around and exhibited a nice balance between sweet and sour. 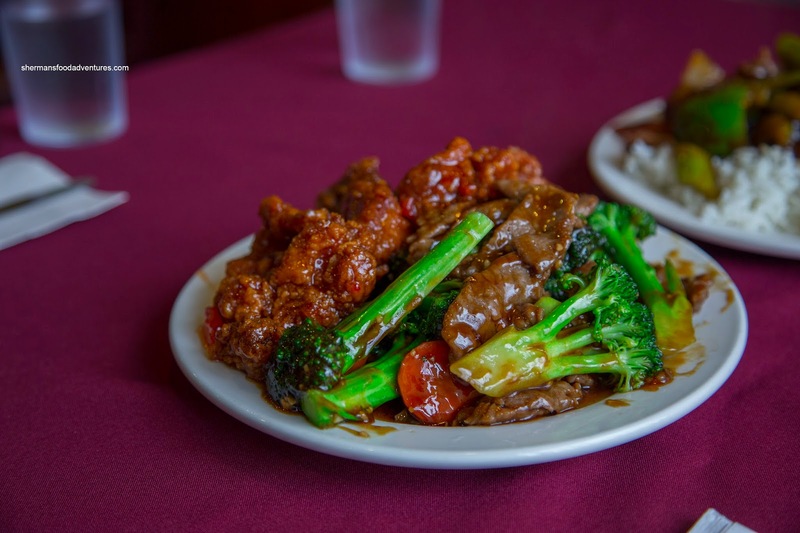 The beef was the same as Miss Y's dish while the broccoli had a nice crunch. There was decent wok heat to the dish as well. Yes, the food at the New Ruby ain't gonna win any awards nor be relocated to Richmond. However, it is cheap and filling where the food is acceptable for the price. 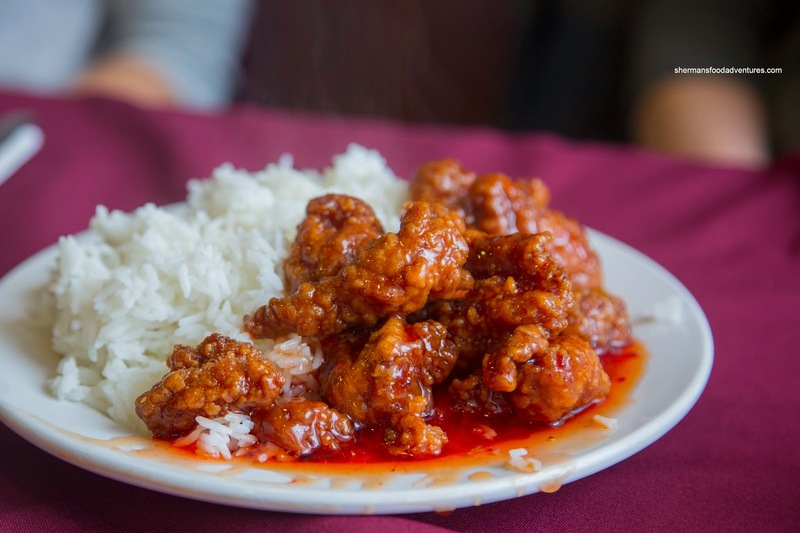 I'm glad to see you writing about the few Chinese-Canadian restaurants that are still left. There are still a lot of seniors, including my mother, who grew up eating at the various Dragon Inns, Rickshaws, and Ding Ho drive-inns way back in the 60's. It's pretty hard to get them to try much beyond the old school fried rice, chow mein and S&S pork combos. @Steve LOL, I was too lazy to take a new picture of the front! Also, I don't mind this food as long as I am expecting it. Dragon's Inn ... we had one in North Burnaby. And there was another at Kingsway & Willingdon. Ah the good ol' days !